On Friday night, over 1000 Idle No More supporters gathered at Queen’s Park for a solidarity rally, part of a global day of action coinciding with a summit in Ottawa, where First Nations chiefs and Prime Minister Stephen Harper discussed budget bill C-45 and its impact on First Nations relations. Idle No More was started in Saskatchewan, in early November, by four women: Sylvia McAdam, Jess Gordon, Nina Wilson, and Sheelah Mclean. Appalled at Bill C-45’s implications for First Nations people, they started holding rallies and teach-ins. Over the past two months Idle No More, propelled by social media, has exploded into a nationwide phenomenon. Supporters in cities all over Canada have staged drum rallies, road blockades, and flash mobs to raise awareness. On December 11, Attawapiskat Chief Theresa Spence began a hunger strike in the hopes of forcing Prime Minister Stephen Harper and Governor General David Johnston to meet with her and other First Nations leaders. Although Spence’s strike was unconnected to Idle No More, she has become the patron saint of the movement. She boycotted Friday’s meeting and still hasn’t given up her fast, which has been ongoing for more than a month. During Friday’s meeting, Prime Minister Harper pledged to hold further talks on treaty rights and land claims with First Nations chiefs. There are three specific aspects of Bill C-45, enacted in December, that Idle No More stands against. Changes to the Navigable Waters Protection Act—a law written in 1882—will lift protections off some of Canada’s busiest lakes and rivers. The revised Act protects only 62 rivers, 97 lakes, and three oceans out of the thousands of bodies of water in Canada. Changes to the Indian Act allow reserve lands to be leased without majority support from all of a First Nations community’s eligible voters. Decisions like that can now be made by a majority vote among community members called to meetings about any such proposals. Protestors say this makes their land more open to developers. The Environmental Assessment Act, which was overhauled in the first phase on Harper’s omnibus budget implementations in April, is weakened further. The changes are intended to streamline resource development by reducing the number of projects that require an environmental assessment to go forward. On top of all this, First Nations protestors feel that their treaties have been broken. They want a say in any legislation that affects their lands. The omnibus bill was passed largely without their consent. They feel as though their needs and concerns are being ignored by the government. Idle No More’s global day of action on Friday involved rallies in dozens of cities across the world, from Canada to Germany to New Zealand. 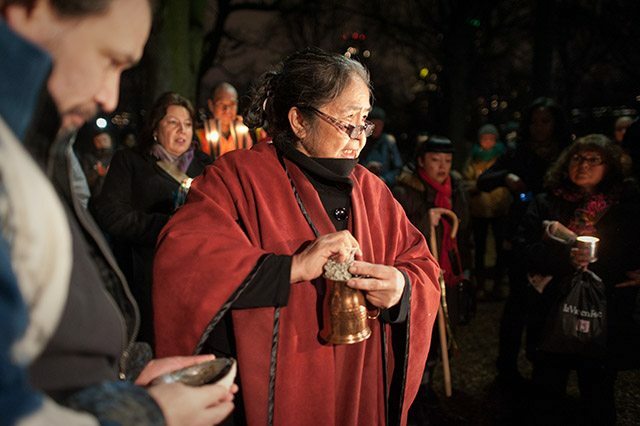 At Queen’s Park, a peaceful gathering of supporters lit candles and an elder performed a sacred water ceremony. Then a candlelight march proceeded down College Street to the Revival Nightclub for a benefit concert. Police blockaded intersections along the way and drivers honked their horns or thrust their fists out of windows while passing by, to show solidarity. The rally stopped at College and Shaw streets and raised a rousing drum chant. The concert that followed rocked late into the night, with a lineup of mostly First Nations artists.